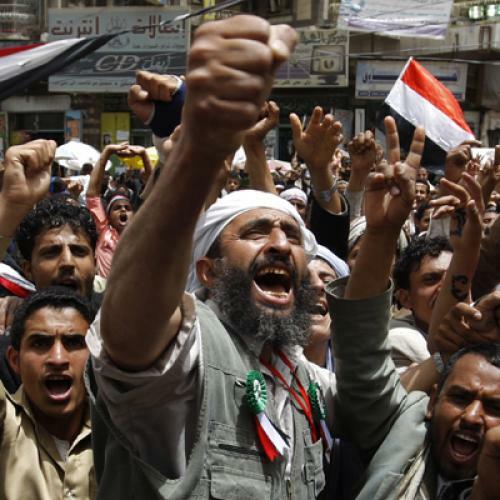 We can’t treat Yemen like the other Arab uprisings. The public uprisings spreading like wildfire from Tunisia to the Persian Gulf have been referred to collectively as the “Arab Spring.” But in fact, as the Obama administration crafts its policy responses, it should strive to avoid this unifying narrative, lest it obscure the unique challenges faced by each country, as well as the distinctive ramifications that each uprising has for U.S. interests. Today, this is nowhere more true than in Yemen, where a fractious mix of insurgents, tribes, Al Qaeda, and secessionists could spark violent chaos if the current president were to leave office, with significant strategic implications for the United States. A year ago, in the aftermath of the Christmas Day 2009 bombing attempt in Detroit, Yemen was branded the “next Afghanistan.” Unsurprisingly, the U.S. reaction focused on counterterrorism, increasing military assistance, and launching drone attacks against Al Qaeda in the Arabian Peninsula (AQAP). With the advent of popular anti-government protests against Yemeni President Ali Abdullah Saleh, the Obama administration has kept a low profile. Perhaps the administration has adopted this posture because it hopes Yemen will go the way of Egypt and Tunisia, where political transitions have been relatively organic and proceeded smoothly thus far. Indeed, it is tempting to see Yemen through this lens: From this perspective, an easy solution would be for Saleh to hand over power to some transitional caretaker authority. However, Yemen is not Egypt; it is a highly tribalized, fragile state, racked by poor governance, incipient separatism and violent extremism. Yet nor is it Afghanistan before September 11; Yemen boasts well-established religious and secular political parties, large youth-driven protest movements and a regime at least partially willing to partner against terrorism. History, demography, and geography have bequeathed Yemen a legacy of factionalism, civil conflict, political distrust, and desperate resource competition. More cartographical construct than cohesive country, modern Yemen was cobbled together from the skeletons of empires past. Until the unification of North and South Yemen in 1990, each of the many previous Yemeni political entities faced, and was eventually undone by, ideological, regional, and tribal cleavages. Six civil wars erupted in the past 50 years, and coups d’etat abounded. These divisions persist, manifesting themselves in the Sa’dah (“Houthi”) insurgency in the north and the secessionist struggle in the south. To maintain some semblance of order, Yemen’s rulers have historically resorted to playing various factions against each other so that none could ever challenge the regime. Saleh has continued this divide-and-conquer tradition, delaying political and economic reforms while perpetuating the divisions that plague the country. For the past two decades, Islamic extremists have been a critical element of the government’s delicate balancing act. In the 1990s, mujahedin—religiously indoctrinated veterans of the anti-Soviet insurgency in Afghanistan—flocked to Yemen, becoming the country’s first generation of terrorists. Saleh’s government largely neglected their presence, even as they bombed the U.S.S. Cole in 2000. In turn, these extremists fought alongside the government in the 1994 civil war and other internal conflicts. But today’s Yemeni extremists are not the same as the mujahedin. AQAP represents a new generation of militants, hardened in Iraq, Saudi Arabia, and Guantánamo Bay. Rather than relying on the regime’s benign neglect, these fighters have allied with alienated tribes, even marrying into them, and found safe haven in the hinterlands. Yemen has been eager to accept international military assistance, but slow to fully embrace the fight against terrorism. The country’s counterterrorist efforts were largely sporadic and ineffective until renewed American pressure last year. Indeed, Yemeni security forces have been much more aggressive against opposition in Sa’dah and the south than in rooting out extremists. Saleh remains an uneven ally against AQAP. He is also no Jeffersonian democrat, and poor governance remains a pivotal problem. Joblessness among a bulging youth population, along with entrenched corruption and oil revenue-fueled patronage, has further undermined the state’s legitimacy. Few Yemenis place stock in the government’s ability to provide for them and instead rely on established tribal structures to secure basic services and justice. Yemen’s fragility is the root cause of, and is exacerbated by, the violent extremism of AQAP; together they form a vicious cycle that Saleh has been unable or unwilling to break. Regardless of his significant shortcomings, however, Saleh appears to have few, if any, obvious successors who could plausibly hold the country together. The opposition remains a hodgepodge of democrats, socialists, tribal sheiks, Islamists, and secessionists who, in Saleh’s absence, would likely find little common cause. If Saleh does in fact resign, the resulting power vacuum, in a country with few democratic political institutions but numerous competing tribes and factions, will be a major challenge. Given Yemen’s history of internal conflict, the possibility of yet another violent, destabilizing power struggle is quite real. Were Yemen’s transition to collapse into conflict, the ramifications for the region and the United States would be grave. Yemen could mirror Somalia across the Red Sea, allowing lawlessness to encircle a major chokepoint for international energy flows; Yemen’s 300,000 barrels per day of oil exports could be disrupted, further tightening global energy supplies; AQAP could gain greater freedom of maneuver; internal Yemeni conflicts could flare into a Saudi-Iranian proxy war; and Yemen’s already impoverished population could face a major humanitarian disaster. The United States has competing interests of democracy, stability, and counterterrorism in Yemen, and it is not easy to balance them all. But we should not feel compelled to choose between freedom and stability in Yemen. The two are intrinsically intertwined, and a coherent policy must pursue both simultaneously. While we ought not precipitate events in Yemen, we must plan for all eventualities and be prepared to protect our interests. If Saleh maintains power, we should leverage U.S. military and economic assistance to push for meaningful political reforms. Should he actually resign, we must ensure that our security interests are not compromised in the ensuing transition. Unlike in Afghanistan, we cannot be driven by security concerns alone. Unlike in Egypt, we cannot be swept up in feverish hopes for dramatic political change. The only hope for a stable and secure Yemen is if the United States assists the Yemeni government in pursuing political reforms, defeating AQAP, and better addressing enduring secessionism. Yemen is not Afghanistan or Egypt, but, with careful and well-considered U.S. support, it has a chance of remaining Yemen. Michael Makovsky, Blaise Misztal, and Jonathan Ruhe are the foreign policy director, associate director, and policy analyst, respectively, at the Bipartisan Policy Center, and authors of the recent report Fragilityand Extremism in Yemen.